This is a creative new opening system from Columbia River Knife and Tool. Originally developed by Depok Chopra, a knife distributor, this system utilizes the thumb stud for starting the assisted opening system. Just press down on the thumb stud and start the opening process and the blade just flies open. They have a stylish look, too! Spyderco Knives put this specialty knife out as their first new entry for 2009. 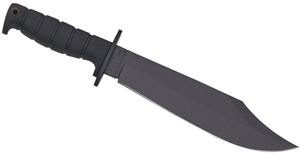 It is a Jumpmaster fixed blade with a great story behind it. Personally, I would not carry a fixed blade when falling large distances through the air to land on the ground, but I’m certainly no expert on parachuting. 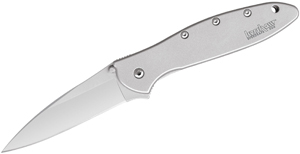 Emerson will have A-100 Mini Folders and a super CQC8. Canal Street will offer an 1873 Cowboy Bowie. Also a stainless traditional liner lock. A new large Muskrat. Spyderco – Here’s some prototypes and concept knives I missed before. How about a Military with titanium handle and frame lock! Just a concept knife- so don’t try to order one yet! Also, a new rendition of the Hobbit Warrior that Round Eye Knives and Al Mar did years ago! This one has H1 non rusting stainless steel on a broad upswept blade with serrated top. The Police Camo handle Concept, the Breeden Rescue with green G10 handle with an edge that is slightly upswept from sheepsfoot and a sharpened recessed notch on the top of the blade. 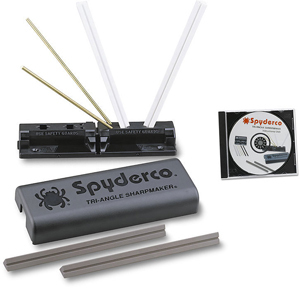 The Ed Schemp designed Balance – very symetrical, tiny crescent shape with 1″ blade with hole in exact middle. The new Perin folder. Bradley folder with CPM M4. Ontario now has the full Ranger line. These are awesome fixed blades made of 1/4″ 5160 carbon steel stock. The thinner knives like the Shiv and Shank are made of 1095 carbon steel. This 5160 is a high carbon spring steel like is used in large truck leaf springs and can take repeated abuse without cracking. They also have their first auto opener. Schatt and Morgan will have three historical models. One is from tooling dated to 1917. They found the tooling in the attic at the Queen factory. Also a cotton sampler with a wide flat blade. CASE has a pink polkadot series of a few models. It is a white bone with pink indents. They have a “desk knife” which is a small fixed blade with sheepsfoot handle and bone or pearl handle. It comes in a leather pouch. They will also have a black G10 series replacing the orange G10. The damascus models will be a tiney trapper, 2 blade tiny toothpick, mini trapper, canoe and stockman.